MECHANICSBURG – A Mechanicsburg man died Sunday from injuries sustained in a farming accident. 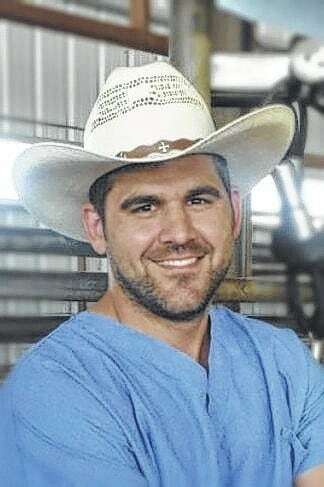 Dr. Austin Ayars, DVM, 34, died on the Ayars’ family dairy farm on Rosedale Road in Pike Township. Ayars, a large animal veterinarian, was found dead inside a grain feed mixer just after noon, according to a report from the Madison County Sheriff’s Office. He was pronounced dead at the scene by Madison County Coroner Dr. James Kaehr. Ayars had recently returned to Ohio from a large animal mobile veterinary practice in Arizona. He was working on the farm of his parents, John and Bonnie Ayars, when the accident occurred. Dr. Ayars is survived by not only his parents, but also his wife, Adrienne, son Lane Wendell, 4, daughter, Layla Evelyn, 2, and an unborn child. He is also survived by his brothers, Lucas and Eli Ayars of Mechanicsburg, and other family members. Ayars was a 2007 alumnus of The Ohio State University School of Veterinary Medicine, where he graduated with a degree in animal science in 2003. He began his veterinary practice in 2007 in Arizona with the Herd Health Management Company. Later Dr. Ayars established his own business, Ayars Veterinary Service. The Ayarses had recently returned to the Mechanicsburg area to be closer to immediate families, according to the obituary.